I think I have always been a storyteller. When I was a child, even before we had electricity, I looked forward to the evenings with my family when we would sit around the kitchen table and talk about the day’s events. I can still see the warm glow from the gas lanterns casting shadows on the walls. Sometimes I would make up wild adventures about a ferocious alligator living under our dock. Or scare my sisters with tales of a mysterious creature lurking in the icehouse in our backyard. That was all before hydro wires reached my house and “I Love Lucy” invaded my living room, and when Apple was still just a fruit. I believe that television and other electronic mediums so readily available now in every home, have contributed to shutting down the human voice. As many of our children are growing up on a diet of bland TV sitcoms and computer games as their intellectual junk food, they become desensitized to the tug of their own emotions. It’s very hard to return to the traditions of oral communications in a world of sound bites, where we simply ‘turn off’ or ‘tune out’ if we don’t like what we hear or see. It’s much too easy for children to transfer this behavior into real life situations. It hurts my heart to know that oral storytelling is becoming a dying art for many families. In my view, it’s the most practical and natural means of talking about ordinary or profound matters that would otherwise never be discussed. It’s a way to teach children and adults how to listen respectfully to each other’s voices and to feel connected by hearing our own feelings expressed by others. And as sure as a love of stories is connected to a love of reading…oral storytelling is connected to building confidence and self-esteem in children. It’s my belief that teaching the art of oral storytelling is an investment in the futures of our children and grandchildren. It gives them a basic training in sequencing events, and organizing thoughts and experiences into chunks; an invaluable skill to have at any age. And it teaches them how to listen and be heard; a basic ability so many adults have never mastered. Children tell stories as a way to solve problems and understand the world around them. If you want to know what your child is thinking about, listen to their stories. So maybe it’s time to put away the tablets, cell phones and laptops and let our imaginations do the talking. Young children love to hear stories about themselves, especially when they were babies. Repeat the stories often and ask them to tell you the stories back. Have the child “picture read” from a favourite book; don’t read the words. The child will go from page to page telling you the story from what they see. Tell them lots of stories from your childhood, and add funny details that will appeal to young listeners. They will love to hear the shenanigans you got up to. Ask the child to choose 3 things they want in a story. (IE; a bear, a kite and a boy.) Make up a tale that includes these items, then ask the child to tell you a story with your 3 things. Put together a storytelling tray by gathering a variety of small objects from around the house. Take turns choosing an object from the tray and make-up stories about each of them. Have fun telling continued stories. This can be done with one of more children, as everyone adds a portion of the same tale as the story progresses. Create a magical space to tell your stories. This can be anywhere – like in a soft cozy chair, under a favorite tree or on a simple blanket on the floor. Special snacks can also set the mood. Two of the most important skills we can have as adults, is our ability to adapt to change and be proficient in public speaking. It’s been said that some people would rather choose death over speaking in public! Now how silly is that? By consistently developing our narrative skills from an early age, we become comfortable with shifting plots and thinking on our feet, as it were. And as we mature, we learn to embrace change and gain confidence in our ability to speak out and engage others. These are huge life-skills that go a long way in helping children to become successful adults. Through oral storytelling exercises, I believe the power of language can help to develop thinkers, imaginers and status-quo shakers. By exercising our creative muscles from an early age, we learn to be inventive, ask questions and look outside the lines. What a simple but powerful gift we can give to our children and grandchildren – a gift that will keep on giving for many years to come. Now isn’t that a legacy we would all like to leave behind? Teaching Through Story: What would happen if a slithering cyberwoozle oozed its way through the back door of your computer and in one big SLURP, you were sucked into the Internet? Well, that’s exactly what happened to surf-suckers Henry and Fanny Farkenworth. Now with no way to get home, they’re in danger of being moofed and lost in cyberspace forever. Complete with purple murples, spamdunkers and pop-up hucksters, the net-lingo is fresh, cyber-cheeky and ripe for a now generation of kids, living in a universal world of computers. 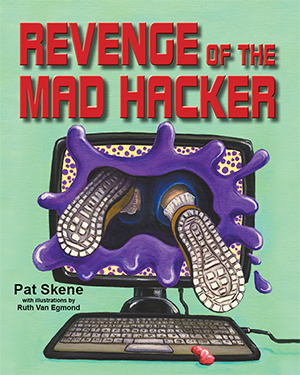 Check out the Exclusive Interview with the Mad Hacker at the end of the story…and the Safe-Surfing TIPS for Parents and Kids.